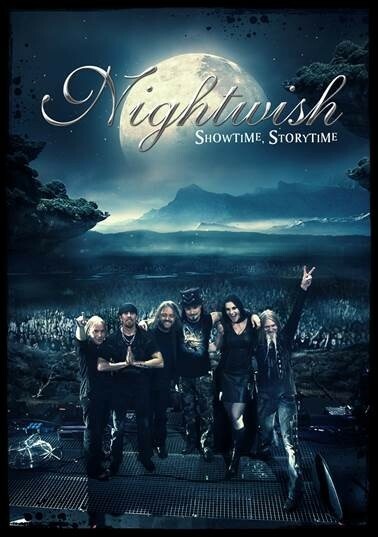 Released coincidentally with confirmation that Floor Jansen and Troy Donockley are to become permanent members of Nightwish, this 2-disc DVD set covers their headlining show at Wacken in August 2012, and a world tour documentary encompassing 104 concerts in 34 countries over a period of 572 days seen by 1.5 million people. Truly an epic tour that stretched the band to breaking point, resulting in the departure of vocalist Anette Olzon back in September last year, as Troy Donockley relates. The Wacken show was attended by 82,000 Rock and Metal fans and with just two shows to go before the end of the tour band leader Tuomas Holopainen chose this show to document the current vibe of the band with Floor Jansen now fully settled into the Modus Operandi of the band. Featuring 15 songs, this is a fabulous concert regardless of whether you were present at Wacken that day or had seen a previous show on their tour. 'She Is My Sin' and 'Romanticide' had come back into the set list after a very long absence due mostly to the fact that Floor loves singing them. Beginning with the bombastic 'Dark Chest Of Wonders' and with an immense light show and pyros going off left, right and centre, this is always the perfect song to get the crowd highly charged. With classics 'Bless The Child', 'Wish I Had An Angel' and 'Nemo' alongside new favourites 'Storytime' and 'I Want My Tears Back' that Floor sings effortlessly there probably wasn't a disappointed Nightwish fan in the audience. Tuomas, behind his pyro-shooting organ pipe set-up that shelter his keyboards was as mesmerising as ever, Emppu Vuorinen grinning away on his guitar and playing the joker whilst Jukka Nevalainen, as ever the consummate professional and sticksman extraordinaire, gave his all for the cause. Marko Hietala, the tall striking blond Viking and counter focal point to the new Dutch lady was his usual powerful presence and as ever contributing the male vocal lines with intent. The fact that members of the audience were in tears at the end is tantamount to how the songs of Nightwish touch people – I know, I've been there, and they are genuine tears of joy! The documentary DVD is entitled 'Please Learn The Set List In 48 Hours'; no prizes for guessing where that comes from! Nearly two hours of thoroughly entertaining concert and back stage footage from all corners of the globe and with all the members of the band. Highlights? There are many if you're a true Nightwish fan but certainly Denver, September 28, 2012 comes near the top. It features amazing footage of the band backstage with Kamelot's two female backing singers, Alissa White-Gluz and Elize Ryd, on the night Anette was rushed to hospital and they were given ten minutes to decide if they wanted to perform in her place singing any Nightwish songs that they knew. Fascinating stuff. Then there is Jukka giving us a tour of the stage set-up for the band and revealing Tuomas' wine bottle holder attached to his keyboard set-up, a secret show in L.A. under the name of 'Rubber Band Of Wolves' sans Floor. Actually, with so many to list, why don't you just buy it and then you can sit in the comfort of your own home and watch and enjoy it like I did – even better! As Troy Donockley so eloquently said; "When you see people crying in the audience, it brings home what an emotional experience a Nightwish concert is."